Installation for most types of connections are collectively called koji (工事), which litterally means "construction." In order to get your connection working, someone from the phone, fiber, or cable company needs to physically come to your residence and hook things up. Hook up is handled by your carrier only, not your provider (see our guide for more details). For fiber optics and cable, a person from your carrier company will call you up and ask to schedule a day to come by and hook things up. Usually they will call and remind you again a few days before. For many fiber optics companies, the installation process is cheap or free so long as you commit to a year or two of service. However, if you miss your appointed installation day, you run the risk of losing your subsidy and having to pay for the whole thing on your own (i.e. very, very expensive). Also, if equipment is not already co-located in your building, they may ask for a contact number for your landlord or building management company. For the most part, landlords don't object to the installation of a fiber/cable jack in your home since it is desirable anyways. If your Realtor is picky, then they might make you get a letter of permission (shodakusho 承諾書) from the person who actually owns the property. Thanks to the job hunting schedule of most big companies, the begining of moving season is March-April so if you plan to get hooked up during this period, expect a bit of a wait. Scheduling a weekend appointment or an appointment late in the day can further increase your wait times. Some companies offer incentives like gift certificates if you schedule on a week day. If you have decided to go with fiber optics, your installation process will differ significantly depending on your residence. Don't be surprised if a whole team of guys show up at your door step. - If you live in a big city high rise apartment, chances are that one or more the big fiber providers in your area has your building wired up and mostly ready to go. Most Realtors will mention the ability to get a fiber optic connection in their promotional materials. Most buildings have built in "fiber plugs" (hikari konsento 光コンセント) that allow for a relatively painless hook up. - If you live in a house or a small condo with four or less units, construction takes a little more time. In the case of a regular house, on your instruction a non-movable outlet will be installed. Once the actual drilling is done, you will get your fiber optic modem. Typically, it comes in one box known as an ONU (Optical Network Unit) or hikari kaisen shutan sochi (光回線終端装置) placed near your fiber plug. An employee will verify that you connection is active and register your service with the head office. Unless you have ordered extra set-up help, setting up your provider password and user name is all your responsibility. We will cover setting up your provider and wireless router later. Cable installation is very similar to fiber optics. If your home already has a coaxial television jack then most of the work involves physically connecting your internal cable to the external cable. Like fiber optics, your house or building needs to be cable ready. Ask your retailer or landlord if your property is cable ready. 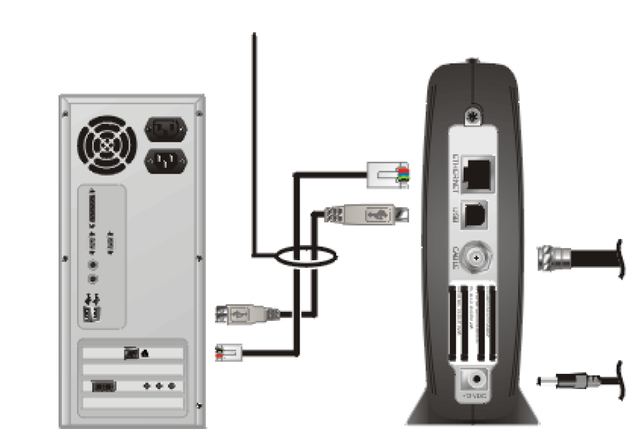 Modem set-up is usually done on-site, but you are responsible for setting up any extra equipment like wireless routers etc. Getting DSL is a bit different compared to cable and fiber. Like fiber, your provider will let NTT know that you want a DSL connection and NTT will drop you a line to schedule a set-up day. After you make the appointment, your provider will send your their own modem via the post so make sure you have that in your hands before the NTT guy comes! Since most houses and apartments already have a phone jack, set up is much less of a hassle compared to fiber. Basically, NTT will test the integrity of your copper wires and make sure everything is in order before plugging in and registering your modem. However, setting up your provider user name and password in addition to setting up extra routers is your responsibility. For our next feature we will look at some of the great extra internet related services you can sign up for like home phone and TV. Stay tuned! This has been so hepful. Thanks soooooo Much! Can you choose a weekend for your installation day? Some post I read said you can't choose a weekend to set up your internet others say yes. Sorry to get back to you so late. Yes, you can choose a Saturday (and I think Sunday) for your installation date, at least for NTT. Usually the people who actually come and run the cable are working for a small business to whom the telecommunications company is sending their contracts. So I think it depends on whether technicians in your area are bidding for Saturday installations, but I'd expect that some usually are. The trick is that even when Saturday installations are available, a lot of other single people are only ever home on weekends, so those days get booked out several weeks in advance. The second time I contracted with NTT, I had a Thursday off from work. Thanks to that, and the fact that I called ahead of my moving date, I was able to schedule an appointment just a few days after I moved in.